"With the same precision he brought to earlier studies of alternative medicine and religious dimensions of wine consumption, Fuller now looks more broadly at how Americans have looked to a host of drugs to open vistas to the Sacred and cement bonds with fellow seekers. Sure to provoke controversy, Fuller's study reminds us that all Americans are 'heirs to a narcotics complex' in their spiritual journeys. A fascinating, absorbing book." 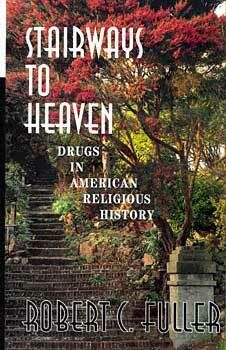 "Stairways to Heaven presents a virtually psychedelic panorama of drug use in American religion past and present. Fuller shows that pharmacological and oenological religion, whether viewed as angelic or demonic, has not been a mere curiosity, but a frequent sidebar to American faith. while aspects of this story have been studied before, particularly in relation to William James, Aldous Huxley, and the drop-out, turn-on Sixties, this book gives the big picture and shows the connections." Fuller's thoughtful and thorough examination of the historical link between mind-altering substances and religious experiences in the U.S. is one of the best books on the subject I have seen. The author explores the broader cultural contexts that influence the meaning and significance of both legal and illegal drugs such as peyote, jimson weed, hallucinogenic mushrooms, LSD, marijuana, wine, and coffee, which have stimulated ecstatic revelations of spiritual truth in the search for ecstasy. Plants covered in this treatment in communities of faith have been transformed into occasional spiritual and mystical experiences to permit momentary transcendence of our normal range of mental and emotional powers, allowing individuals to step outside the confines of their physical sense. A major addition to any library!